Martijn Pannevis is a technology enthusiast, who focuses on new internet related technologies and their social consequences. After writing his MSc thesis on Location Based Services on mobile phones, he founded his second company, Nulaz.com, a location based startup. Apart from his studies and his own company, Martijn has also worked at the telecommunications company KPN, where he did technical research for new products. In his spare time he likes touring the canals of Amsterdam on his boat. 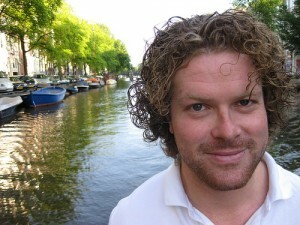 More on Martijn can be found on Linkedin, his blog, or follow @panman on twitter. Maarten den Braber is an avid connector, focusing on technology, healthcare and events. He just finished his MSc thesis about the value of business models for hospitals. He freelances for (amongst others) The Event Engineers, providing event infrastructure solutions. He is co-founder of Nexthealth, a non-profit collaborative focused on connecting people in healthcare, online and offline. As part of Nexthealth he is publishing and presenting about Health2.0 and co-organizing the first NextHealth conference in Europe next year. Learn more about Maarten at Linkedin, his blog, or follow @mdbraber on twitter. We are already looking forward to set up our February 2nd event on Mobile Gaming with our new team. As soon we have more details on the speakers we’ll let you know via the blog and Meetup. Are you not yet a member of Meetup? Please sign up here to be sure you receive updates on the opening of the registration and new speaker announcements as soon they are published. All work on the mobilemonday.nl site available under the Creative Commons Attribution-Noncommercial-Share Alike 3.0 Netherlands unless stated otherwise.